Daniel Akaka, born September 11, 1924 (age 94) is a former Democratic United States Senator from Hawaii. He was elected to the House of Representatives from the Second Congressional District of Hawaii in 1971, and was reelected until 1988. 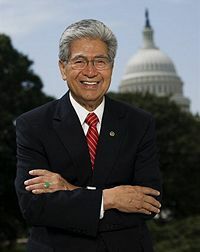 Akaka was appointed to the U.S. Senate to fill the seat left empty by the death of former United States Senator Spark M. Matsunaga. In April 2006, he was selected by Time magazine as one of "America's Five Worst Senators." The article criticized him for mainly authoring minor legislation, calling him "master of the minor resolution and the bill that dies in committee." During his 2006 Senate reelection campaign, Akaka faced a primary challenge by Congressman Ed Case. Akaka won the Democratic primary by eight percentage points and went on to win the general election by twenty-six points. Daniel Akaka votes with the Democrats 96.1% of the time. In February 2009, he voted for President Obama's American Recovery and Reinvestment Act. "This vital legislation will create jobs." In November 2009 Akaka stated that he was not aware of the Constitution giving Congress the authority to make individuals purchase health insurance, as health care bills in both the House and Senate require. Akaka announced on March 2, 2011, that he would not seek another term as senator. He previously served on the Select Committee on Ethics. This page was last modified on 26 September 2018, at 10:09.